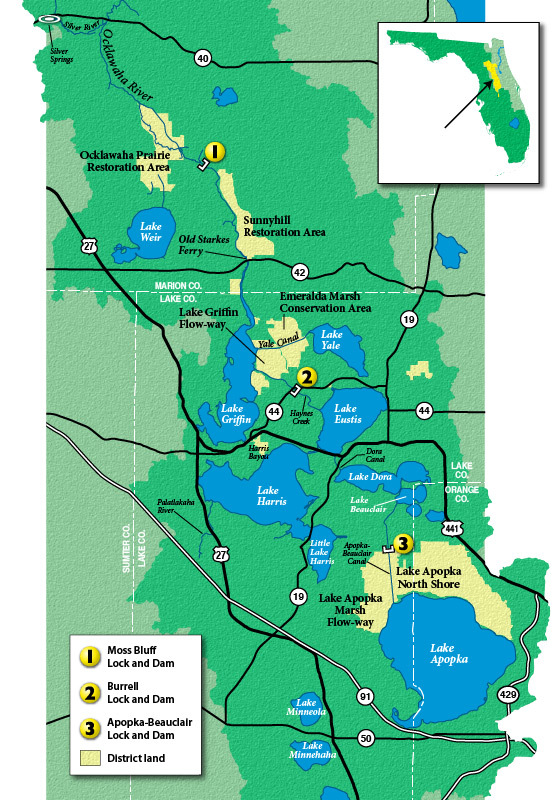 Recreational boaters visiting the Upper Ocklawaha River Basin may encounter a navigational lock. The locks are used to move boats through water bodies of different elevations. There are three locks within the district: Moss Bluff Lock on the Ocklawaha River, Apopka-Beauclair Lock on the Apopka-Beauclair Canal and the Burrell Lock on Haynes Creek. Each lock has specific hours of operation and may occasionally be closed for needed repairs. Lock attendants are present during operating hours to help boaters safely navigate through the lock. 7 a.m. to noon 1 p.m. to 7 p.m.
8 a.m. to noon 1 p.m. to 6 p.m.
Apopka-Beauclair 15 ft. 60 ft.
Burrell 28 ft. 66 ft.
Moss Bluff 30 ft. 139 ft.